If the Falcons start 2019 0-2, they will be 100 games under .500 for the franchise history (playoffs included). The early history of the team was a rough one, with occasional pops of competitiveness breaking up the monotony of losing. That’s true for a lot of teams, of course, but the Falcons are one of those. But if you have a child who was born on Jan. 1, 2008, that child has pretty much only known the Falcons to be competitive. In the 11 years of that hypothetical child’s life, the Falcons have three division titles, six playoff appearances, a Super Bowl they should have won very recently, and a combined 106-80 record. Perfectly good. Congratulate your 11-year-old on a recent birthday for me. Let’s take a look at the best Falcons fantasy seasons of the last decade. Ryan’s monster season had the misfortune of coming at the same time as Patrick Mahomes’ so-much-more-monster season, which means he put up the 14th-best fantasy QB season of all time largely in the shadows. For Ryan, though, it’s the culmination of a long stretch as the Falcons’ only quarterback. Chris Redman’s 119 pass attempts in 2009, when Ryan didn’t play all 16 games, is the only time a player other than Ryan has more than 28 attempts in a season since he joined the team. The Falcons have had Michael Turner and late-stage Steven Jackson on the roster over this stretch, but Turner’s last of involvement in the passing game and Jackson’s age kept them from putting up numbers even close to what Freeman did in 2015 (or 2016, frankly). 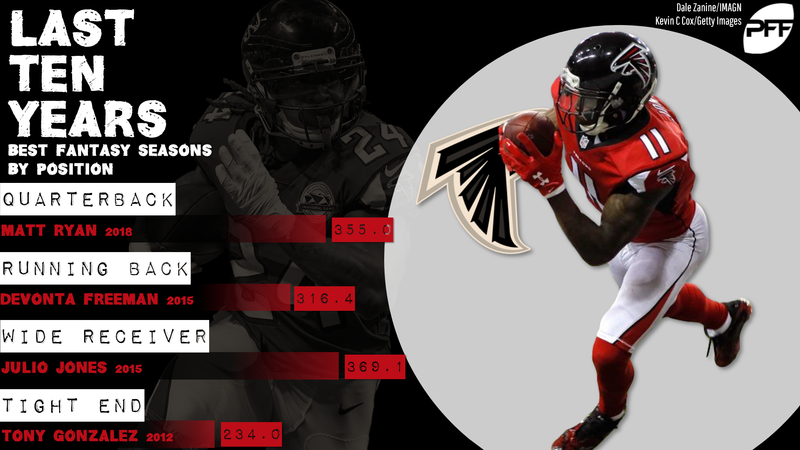 Freeman has never again put up numbers quite like he did in that monster season, largely because his receiving production hasn’t been there — his second-highest career totals have been 54 receptions and 462 yards — but he stands to be the bell cow or close to it in 2019 with Tevin Coleman likely to leave in free agency. That 2015 season for Jones featured the fifth-most targets of all-time and the second-most receiving yards (with Antonio Brown that same year coming in fourth). It was also the second of Jones’ five straight years (in a still-active streak) with at least 1,400 receiving yards, an all-time record. He might never be an elite touchdown scorer (though he did score 10 on 129 targets in 2012 and then 8 over 89 targets in the second half of 2018), but Jones’ ridiculous yardage abilities are unlike anything we’ve ever seen. Austin Hooper was something of a third-year breakout in 2018, finishing as fantasy’s TE6 (albeit in a very down year for the position). His fantasy total would be 71 points shy of Gonzalez’ best year as a Falcon, and the five years Gonzalez spent in Atlanta are the top five TE scoring years the Falcons have had in the last decade. He’s a worthy Hall of Famer, is what I’m saying.